How to coach groups of mixed rowing skill? The adult women’s squad I help coach has a wide range of skills and experience. The current winter training plan has two outings a week (so pretty limited). I have some people who are happy to row socially and others who want to win at Head of the Charles and World Masters Champs. I am being pressured to put out crews with mixed skills and experience on our Saturday session with the idea that the less experienced rowers will benefit from outings with more experienced ones. We’ve tried this a couple of times and the result is that the experienced rowers get pissed off and the less experienced ones get pissed off and overwhelmed. Sure, we could set up the session so that it’s much more relaxed or more of a technique row. From your experience, is this mixing up of crews a good use of precious training time for everyone? I can reply and tell you what we do at my masters rowing club. Saturday 7 am row is reserved as a ‘free come for all’ session – locally called ‘jamming’. So you go out with mixed ability crews. 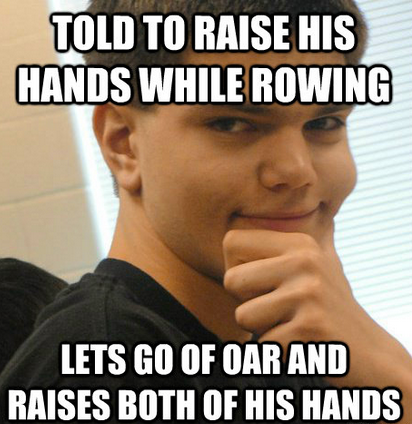 We have folks who don’t want to race and only do social rowing and this session is for them. Anyone who wants a workout goes out before-hand at 6 am. At all other outings including Sundays you can request a crew / boat for more serious training in fixed crew combinations. Similarly when it comes to regattas, the serious folks request 2 or 3 crew combos they want to do which are people of similar ability / speed and can win races. Then we make ourselves available to the rest who are less experienced for other events. But it sounds to me like your club members need to get together and agree a club strategy – here’s how to do it Writing a rowing club strategy and part 2. Have a read of those and see if they help you. How does a coach manage a range of athletic ability? First you need to acknowledge that most serious athletes are inherently selfish. If it doesn’t benefit me directly then “why should help him/her”. Has anyone ever helped them get to where they are today? I would ask the squad for solutions as to how they think it may work for them, how often, what work/skills workout would be appropriate. I think you need the buy-in from the athletes so as to not build resentment. What about a buddy or mentor system? This could work in which an experienced athlete from your group mentors a junior/intermediate athlete. They take some responsibility for that athlete and advise/teach drill or whatever that athlete needs maybe advice on weights, time management, recovery etc. They could meet formally or informally as often as they want, say for 20mins a fortnight, maybe watch their buddy do some erging then suggest a tip or two. It may take some load off you and keep/get the more experienced athletes some experience of explaining what they are so good at doing. It might help them with their own rowing as they will need to think and call on their own experience to be of any benefit in that roll and if they do it well gain respect from their club mate. Have any readers got suggestions for other solutions? This entry was posted in Club Management, Coaching, Rowing, Sculling. Bookmark the permalink.